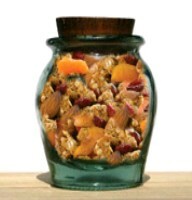 Here’s a light, nutritious and delicious granola mix than you can store in an airtight jar or container for up to one month. (NC) A well balanced breakfast sets you up for the day ahead. This delicious recipe comes from Rose Reisman, a health and wellness consultant and national spokesperson for Breakfast for Learning. Substituting orange juice for part of the oil, this healthy granola recipe is an excellent way to start your day off right. If you want the granola crisper, leave it in the oven with the heat off for another two hours. Feel free to substitute any dried fruit you like. Line a baking sheet with aluminum foil and spray with vegetable oil. Combine the oats, flour, sugar, cinnamon, ginger, oil, orange juice, maple syrup and nuts in a mixing bowl; mix thoroughly. Place on the prepared baking sheet and bake for 35 minutes, tossing once to prevent burning. Add the dried fruit. Serve immediately or store in an airtight container. Make Ahead: Keep up to 1 month in an airtight container. For more great recipes, and tips on eating a healthy breakfast visit www.breakfastforlearning.ca and www.artoflivingwell.ca.